You can now modify premade NPC's attributes on respec. All usual limits on points apply - you can't cheat with it. For premade NPCs only, adds attribute customization step when levelling up to level 2. This means that you can customize attributes either when initially picking up a companion, or immediately after respec. Removes the "override attributes from prefab" logic (it's the same thing that prevents changing attributes via save game editing). You won't be able to customize attributes for level 1 companions - this is a very minor thing, it essentially only matters during prologue. You won't be able to customize level 1 abilities - the tricky thing to implement here are "special" things like Sagani's custom fox pet. If you ever start a game without mod, on load customized attributes will be reverted, since "override from prefab" logic would be restored. 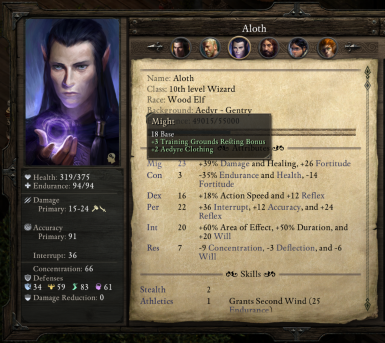 There is a UI artifact on level-up to level 2 for NPCs - attributes and increased skills overlap. This is a very minor issue.